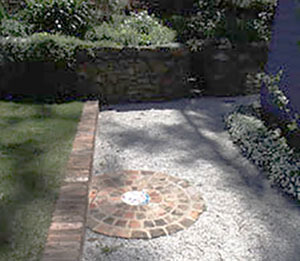 Garden features that include paving, steps, streams, water features, ponds, fire pits, pizza ovens, champhered pillars, seating walls and art installations and large stone circles. We've also built arches and bridges. Wherever possible we use locally quarried stone. Many the projects features here have been designed and constructed through a process of working with our clients and developing thoughts and possibilities into original, practical and garden enhancing features. In other projects we have experience in matching the look and age of an existing stone feature, such as a retaining wall, that requires extending. This matching of existing work opens up many opportunities to further enhance an existing feature and give new life to gardens, entrances and pathways. We can also match work to photos of work done that give an visual expression of your thoughts and ideas. Stone is indeed 'flexible' in meeting your requirements and we can also be flexible and keen to build whatever you can dream up. No job is unachieveable! Dry stone walls, for example, can be a feaure in any garden, no matter the style shape or size of the garden. They can be used to enhance entertaining areas and create additional levels within a garden or entertainment area. They can even be used as a mount for art illustrations or can be used as art themselves. These, and other features we've designed and constructed can be viewed in our Garden Features gallery. 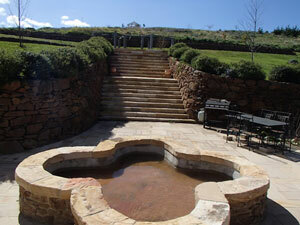 Many of our clients have their own ideas to add or extend an area of a garden that is under utilised. These ideas can be turned into reality with some creative thinking and our knowledge and experience of the many uses of stone. 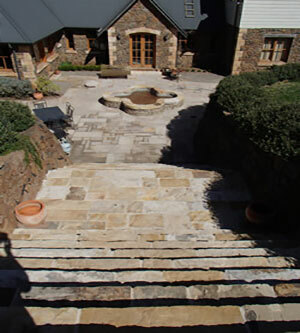 Putting your ideas and our experience in stonework together can create garden features that add to the use and enjoyment of properties which, in turn, enhances its general ambience and pleasure. 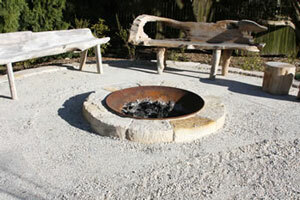 Take this opportuniy to view more of our work in the Garden Features photo gallery. We have many more photos so please contact us if you would like to see more of the projects we've completed. There are also photo galleries showcasing our work on complete homes and different types of retaining and drystone walls.